The EF Duplicate MP3 Finder is a useful program that help you to find out and remove duplicate audio files with same or similar properties, files that occupy so unnecessarily storage place on your computer or your server. In addition the program analyzes the artist and title information from the ID tags contained in the audio files and compares these with the appropriate entries in other files. If this informations are not present, it try to interpret it from the file names if possible. You can adjust individually if search for exact dupes or for similar files. In this way it is possible to identify similarly titles with smaller differences. EF Duplicate MP3 Finder support the audio formats MP3, Ogg/Vorbis, FLAC and WMA. 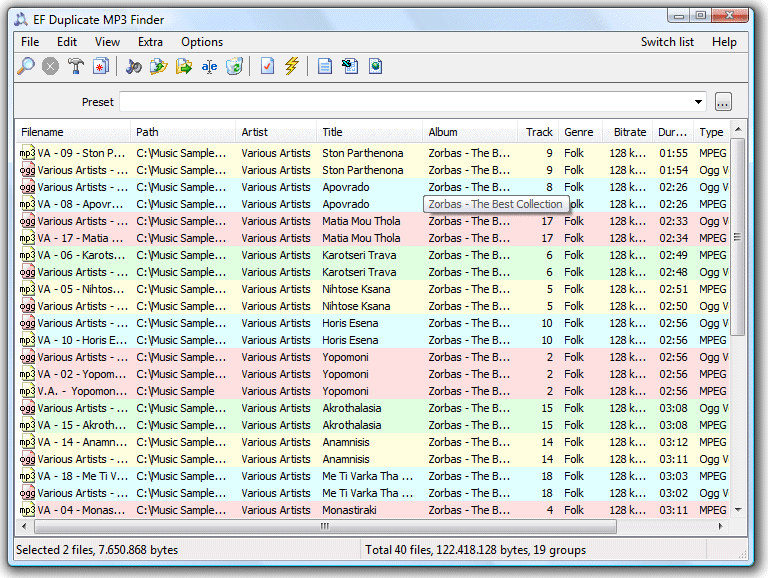 The EF Duplicate MP3 Finder looks if desired in multiple drives or multiple paths for dupes and recurse in subfolders. Folders can be excluded from the search and various filter makes possible to limit the number of results e.g. according to the file date or the file size purposefully. Frequently used search options can be stored and been available as presetting then later at any time again. This function can be used to accelerate the search procedure. Also important system folders can be excluded from the search, so that system files are not even handled, i.e. Windows backups. After the EF Duplicate MP3 Finder locked the search, he presents the dupes in a clear, polychrome list, found in accordance with the criteria selected before. The colored representation makes a simple and intuitive recognizing possible of similar files. They can now decide, what you would like to do with the found files. The EF Duplicate MP3 Finder supports you here among other things with functions for the deletion, copying, moving or renaming the entries. Or you can save the list of the dupes found for later processing. The formats HTML, CSV or as plain text are supported.